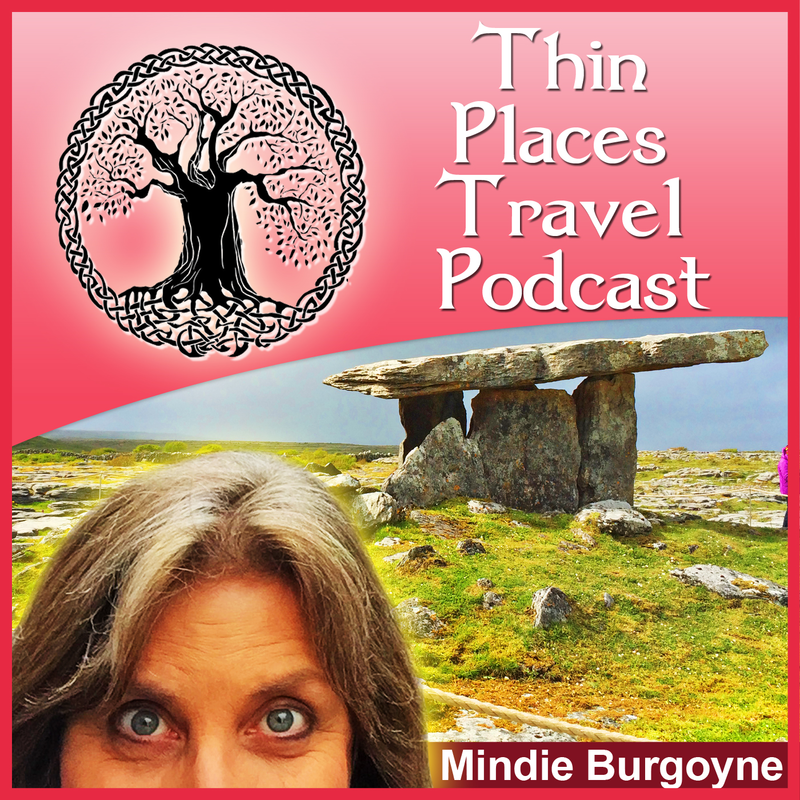 Thin Places Mystical Tours can provide personal travel itineraries to thin places in Ireland and Scotland for those who wish to make their own travel arrangements but need help in finding those sacred sites along the way. Our tour operator can find out what sites or regions are important to you and how long you plan to travel, then provide you with a day-to-day itinerary (up to 10 days) that offers multiple possibilities for visiting mystical sites – some rarely seen or visited by travelers. All of the sites are mapped on Google Maps with a daily schedule of site possibilities. Drive times can also be determined based on the digital map. Guests have multiple sites to choose from each day (more than they could possibly visit) allowing for maximum flexibility. The Digital map can be easily be loaded into the guests mobile device for ease in traveling while in country. Tour operator can also add in guests’ pre-booked accommodation sites, airports, ferry locations, etc to give a full perspective of the tour. This package also includes a one-hour consult by phone or Skype with a tour planner for questions and instructions on how to make the most of your personal itinerary. Each customized itinerary is uniquely crafted to match the guests’ personal travel preferences. Personal Itineraries Start at $500. 7-Day Turn-around. $150 due to start the process, with the remaining $350 due upon delivery of the itinerary and digital map. PERSONAL INTERVIEW TO ASSESS TRAVEL PREFERENCES – Interview with tour operator to discuss your personal desires for the tour – sites of interest, regions, preferred pace of travel. 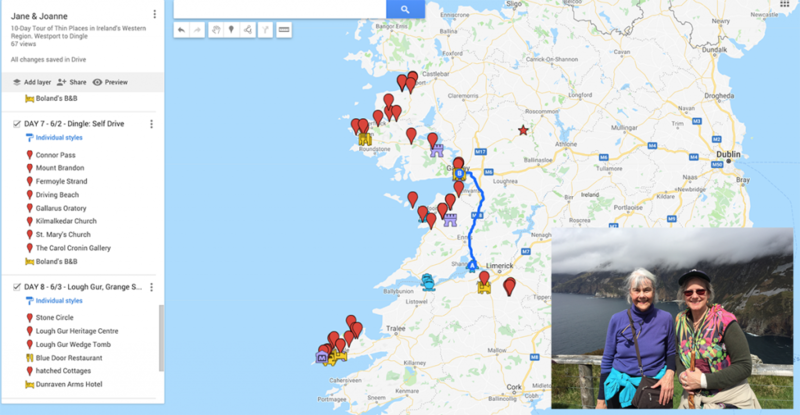 GOOGLE MAP with 20 to 30 sites charted to exact (or near exact) location. Also included could be pubs, shops, and or attractions of interest near the thin places that are mapped. This map can be downloaded and used in country with a mobile device so that the map is always with you – guiding and direction. ONE HOUR CONSULT with tour operator via phone or Skype to go over the itinerary map with opportunity to ask questions and receive additional recommendations from tour operator. 7-DAY TURN-AROUND – Thin Places Mystical Tours can produce the completed custom-crafted itinerary within 7 days of the initial consult. Processes can be expedited if necessary. Base Cost for personal itinerary is $500. Private local expert guides and advance purchased attraction tickets can be added for an additional cost. Email contact @ thinplaces.net or Call 301.648.2010 for more information. Not sure what sites you want to see or what region in Ireland that you want to visit? Have a look at these sample itineraries.